Type of Wood: Oak, hickory, maple and other hardwoods. First, let us point out that this review pertains to the Royal Oak lump charcoal which is made from American hardwoods. 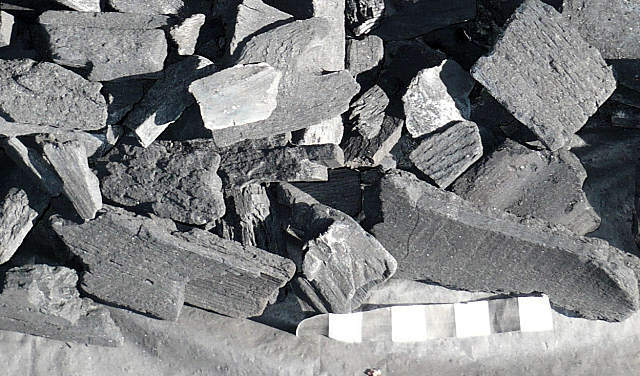 There are at least 3 other types of Roayl Oal lump charcoal which come from Brazil, Argentina and Paraguay. The bags all look remarkably similar, but if you look closely you will find the county of origin listed on the bag. It contained a nice variety of sizes with no scrap or funny stuff. We found some lumber mill scrap (i.e., the sides of logs that had been cut off, known as "slabs" in the lumber mill industry) but not too much bark. It has a mild pleasant wood smoke smell. Below you will see the outstanding distribution of sizes we found in a bag we bought at Wal*Mart. This should dispel the myth that it is the fault of the jack-booted minimum-wage workers at Wal*Mart who stomp the lump into tiny pieces. We are convinced that the size distribution is based primarily on the size distribution being put into the bags at the factory. The amount of chips and dust in this bag was a new record for least amount of chips and dust in a bag of lump charcoal. The charcoal is easy to light, taking a lower-than-average 2.5 sheets of newspaper to get started in our chimney starter test. The charcoal burns for a long time with a low amount of ash production. It is widely available and is reasonably priced. All in all a very nice product and it gets our Highly Recommended rating. Other brands made by Royal Oak: Chuckwagon, Grill Time, Big Green Egg, Real Flavor (Wal*Mart), Wegmans, Best Choice, and Nature-Glo. 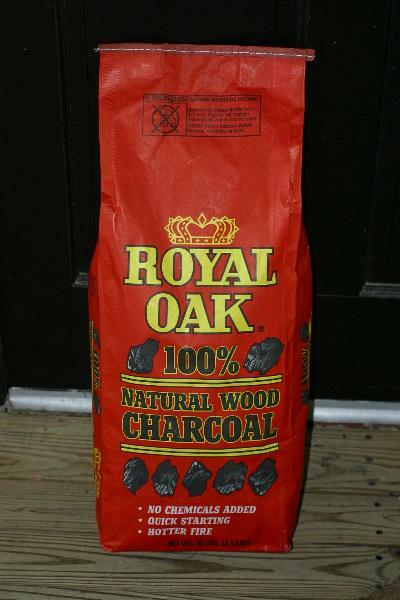 "No chemicals added", "Quick starting", "Hotter fire", "100% Natural Wood"
Royal Oak 100% Natural Wood Charcoal is changing the flavor of the backyard barbecue. 100% Natural Wood Charcoal is real charcoal. This naturally shaped charcoal lights quicker and burns faster and hotter than regular charcoal briquettes. There are no fillers added. In fact, this is the charcoal our ancestors used." "What is 100% Natural Wood Charcoal? Appearance Looks like wood burned after a campfire. No two are alike. 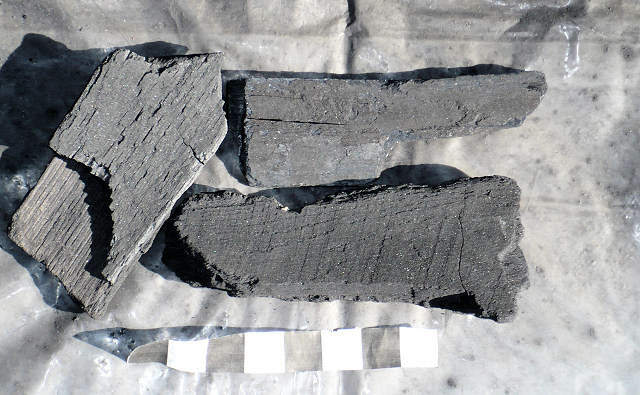 Pressed pillows of charcoal. Uniform in shape. Content Only 100% wood is used. Made from oak, hickory, maple and other hardwoods. A blend of woods and fillers. Only 100% wood if stated on bag. Heat Value Cooks hotter than regular briquettes. Great for searing in food flavor. Lasts longer for extended cooking. Time Takes 15 minutes to get to cooking temperature. Takes about 30 minutes. 'I personally stand behind our product and offer you my guarantee of satisfaction.' J.P. Keeter, Owner"
"For over 60 years Royal Oak has been proud to provide you with premium quality natural wood charcoal. We at Royal Oak stand behind our product and offer our guarantee of satisfaction. We want your barbecue to be successful and if you have any comments or questions please write to us at One Royal Oak Avenue, Roswell, GA 30076." "For best results, start your fire 15 mintues before cooking." "1. Ligher Fluid Method. Arrange Royal Oak Natural Wood Charcoal in a pile. Sprinkle with Royal Oak Lighter Fluid. 2. Wait one minute for the fluid to soak in. Light the pile in several places. 3. Wait 10-15 minutes or until nautral wood is ashed over. Spread charcoal before barbecuing." "1. Optional Light Method. Open air vents on grill. Tightly crumble or twist 3-4 newspaper sheets and place on bottom of grill below bottom grate. 2. Place natural wood charcoal on top of grate. Leave at least 1 to 2 inches of air space between paper and charcoal. 3. Ignite paper. When coals are ashed over, begin cooking (10 to 15 minutes)l Add more Royal Oak 100% Natural Wood Charcoal as needed." "Do not pour lighter fluid on burning wood charcoal. Never use gasoline to light fire. For best results, store this bag in a dry place." Here are the contents of the bag sorted into large, medium, small, and chips and dust. Here are the larger pieces we found in the bag.